Small business owners such as freelancers have to deal with multiple customers/clients on a frequent basis. If you happen to be in this type of business, you know how difficult it can be to remember every meeting and conversation that you have had each day (especially after those long weeks). A customer relationship management tool such as Contacts Journal can make you more productive and save you time tracking your conversations and tasks on your iPhone. 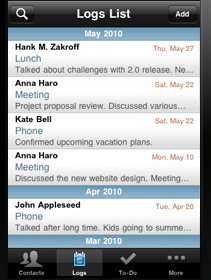 Contacts Journal is a powerful tool to track everything that goes on during your busy business days. 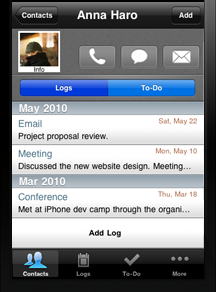 It can log all your activities with your contacts and keep you on top of your projects. Each of your meetings will have its own action items. Thanks to this tool, you can link those to your contacts. It can act as a mini to-do list manager for your projects too. Contacts Journal will act as your action center. Using it, you can figure out what has gone on in your past meetings with clients and even call/SMS/email them from this app. Dropbox support is a huge plus though you can export your information by email or to CSV. If you are a small business owner and need a tool to keep track of your client interactions on iPhone, Contacts Journal has you covered.